I’ve been shopping around for attraction tickets lately and was super pleased to stumble across Attractiontix. 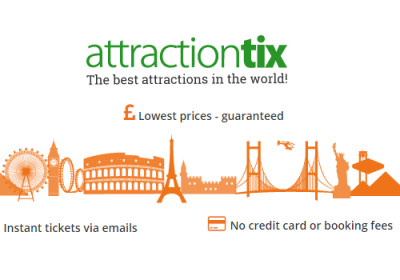 They have some really great prices for attractions not just in the UK but abroad too! Ripley’s Believe it Not – Kids just £1 !! These are just a few of the great deals that you will find over on their site guys, it’s definitely worth checking out before you buy your attraction tickets. Don’t forget to check out Trip Advisor when planning your days out, they have really great info on attractions and you can read reviews from visitors too. Can I get a deal on 4 tickets to Alton towers or black pool anywhere? Deal for family of 5 for Chester zoo, or Cadbury world.